The highest average review rating of any power inverter brand. Designed as a portable power inverter to power up multiple items and most major household appliances. A must-have for your road trips, vacations, outdoors, emergency kits and more. Enjoy 4.8A dual Smart USB ports and 2 standard plug outlets for convenient charging on the road. For DC12V ONLY, not applied for DC 24V and airplane use. 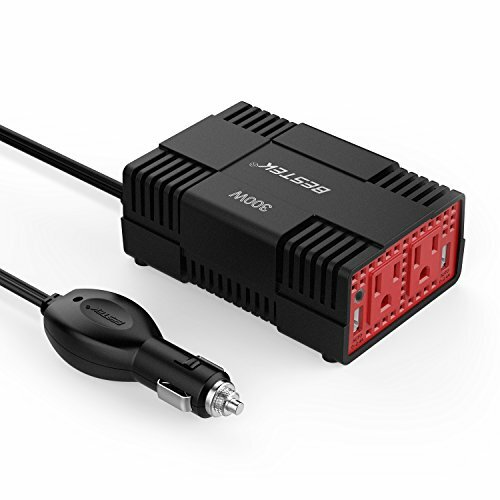 If the rated input of any connected AC devices exceed 150W, please use battery clamps to directly connect to your vehicle's battery as most vehicles 12V ports are rated and fused for 150W. Caution! Not designed for high power electric devices such as hair dryers, electric heaters, curling irons, etc.